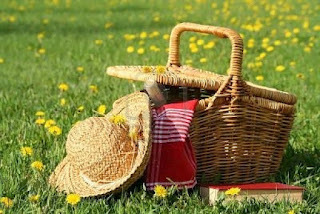 I am packing up and getting ready for our day in the park for the St. Louis Pagan Picnic, tomorrow. It is the 20 year anniversary of the picnic this year. The picnic is open to the public, is FREE and is held in Tower Grove Park, St. Louis, Missouri. The weather forecast for tomorrow is clear, dry and hot... of course. I will be lecturing Saturday, June 9th at noon on the "Mysteries of Midsummer". The lecture is free and everyone is welcome. Since Seasons of Witchery was just released this week, I will have about 3 dozen copies of my newest title on hand for sale at my table on author's row. I will also have copies of my other 12 titles, and my custom designed Garden Witch Jewelry line of charm bracelets. The newest charm bracelet design is based on my book, Seasons of Witchery. It is a standard 7 and 1/2 inches long in gunmetal grey. It has a lobster clasp and features nine pewter charms, one for each sabbat, and a central sun and moon. It is subtle enough to wear to work, or around muggle relatives (ahem) while still being witchy and fabulous. Here is a picture of the newest charm bracelet. It just became available for sale today! For those of you who can't make the picnic but want one of these enchanting charm bracelets for yourself. Hop over to my website and order one. 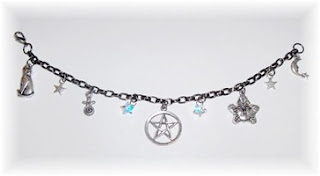 There are a total of three designs to choose from; the new "Seasons of Witchery Charm Bracelet". 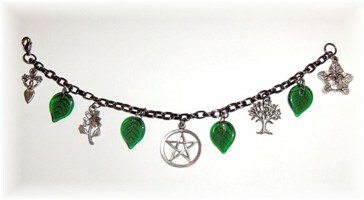 The "Garden Witch Charm Bracelet" that features beautiful green glass leaves and five magickal pewter charms. Oh, by the way, please remember that I cannot take personal checks, credit or debit cards at the picnic. We are going old school and doing cash, for your purchases, while we are in the park. If you want a bracelet and prefer to use your debit or credit card- simply order one through my website. 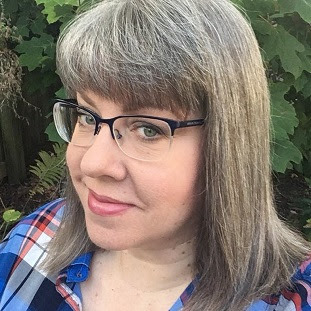 Now I need to go hunt up the lawn chairs, bug spray and sunscreen, to go along with the cases of books, my hand made witchy wooden signs, my jewelry, the display case, and the lunch cooler. I look forward to seeing many of you there in the park!